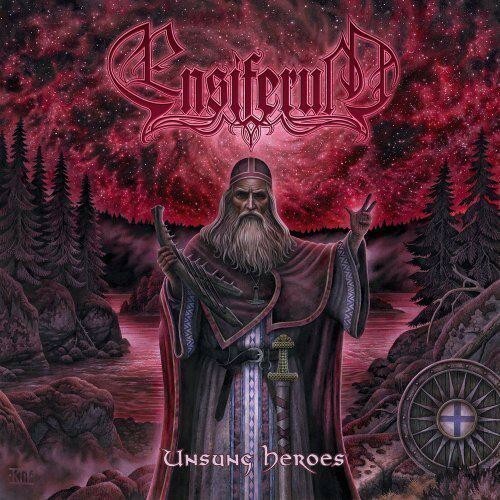 Album number five from the Finnish battle/folk/melodic metallers and the first one since ‘From Afar’ released in 2009. 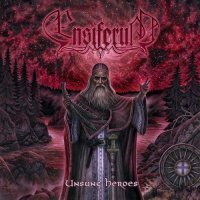 Not having previously had an Ensiferum album within earshot, let alone sat in front of me for review, I went in search of help to put it into context. It would appear that unlike the present album which incorporates lots of folk textures complete with acoustic instrumentation, Medieval elements, symphonic soundscapes, drama and haunting melodies (and quite a lot of guttural male vocals too, I need to warm any “pink and fluffy” readers) the previous offering was a rather less diverse affair and likely less appealing to Fireworks readers but who will undoubtedly enjoy (the mixture of vocal styles here, notwithstanding) the tremendously memorable and catchy harmonies served up on ‘Unsung Heroes’. After the majestic instrumental prelude ‘Symbols’ (the inclusion of such seems to divide opinion), mid-paced rocker ‘In My Sword I Trust’ is a somewhat mundane metal track – until the choirs kick in! It is also elevated by the arrival of clean male lead vocals, which then interplay with the growly ones. However, it is the following six minute title track that truly nails the colours of this album to the mast. It’s a monster of a track (if you can tolerate “those” vocals) with a tune that will burrow into your consciousness. And the choirs, the choirs…magnificent! Following this there is plenty of unexpected variety to unfold, including ‘Celestial Bond’ that could have been lifted from Blackmore’s Night repertoire…but I really must mention album closer ‘Passion Proof Power’. This 17-minute juggernaut is exactly what the term “epic” was designed for! It’s one of the most magnificent “kitchen sink” musical dramas I have heard in a long, long while. Initially sounding like something set in a remote corner of Australia (I kid you not!!) it passes through many different episodes each one with its distinctive mood and atmosphere. At one stage I had to pinch myself to check I was not listening to a Therion album when soprano vocals suddenly appear. For my current taste (no longer just inclined towards the “pink and fluffy”) this is a magnificent way of spending an hour, and I hope that some of you will be enticed. If you are, you will surely not be disappointed!